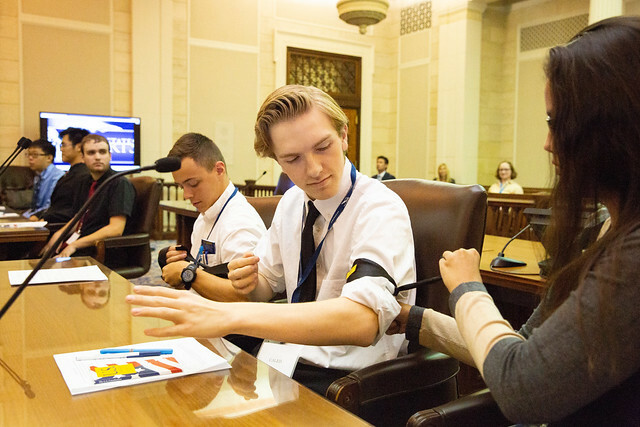 Thanks to Sara Stieler raising her hand, her AP Government students at North High were part of a special observance of Constitution Day on Tuesday at the federal courthouse in downtown Des Moines. The occasion commemorates the signing of the US Constitution on September 17, 1787. It’s been an official one since a federal law so designating it was enacted in 2004, but this year marks the first time that United States Courts invited students to participate in the manner that Stieler’s did. The historic courtroom where the landmark case of Tinker v. Des Moines Independent Community Schools was first heard half a century ago became a classroom instead. U.S. Magistrate Celeste Bremer and Senior United States District Judge Robert Pratt greeted, briefed, and quizzed their guests. Bremer noted and thanked them for their senses of decorum as indicated by their attire, a perfect segue for a US Courts video about the importance of civility to the rule of law. The concept of disagreement without disrespect was featured, something Sieler’s class has been discussing in preparation for Tuesday’s opportunity. Plus, there’s the direct Northside connection to Tinker, the Supreme Court ruling that affirmed students’ free speech rights within the schoolhouse. That case was reviewed and reargued later in Tuesday’s special proceedings. When Mary Beth and John Tinker wore armbands to school in protest of the Vietnam War in 1965, she was a student at Harding Middle School (nee, Junior High) and he was at North. The Tinkers last visited their former schools in 2015, when many in Sieler’s class were attending Harding. Lane said he appreciates that people can disagree but show mutual respect, too. “Oh yeah, just because friends don’t feel the same way about economic policy or whatever doesn’t mean we can’t stay friends,” he said. Tuesday’s agenda also included a webinar via the Newseum in Washington DC and live linkup with student counterparts from a high school in the St. Louis area. Hazelwood School District et al. v. Kuhlmeier et al., a case involving censorship of a student newspaper, originated there about 20 years after Tinker. Des Moines and St. Louis both fall within the boundaries of the US 8th Circuit Court of Appeals. After the Tinkers lost in the US District Court here, they were also denied at that level. The only round they won out of three was the one that mattered most. The SCOTUS ruling in their favor, and the favor of all public school students since who are their legal descendants, was by a resounding vote of 7-2. The 1969 decision will be 50 years old next February, something else to celebrate in Sieler’s class. “Yes, I think we’ll plan on that,” she said, sitting in the courthouse gallery while her students filled seats at the attorney tables and in the jury box. We’ll be anxious to see how she tops this day in court.